List Rules Vote up the stunts that Chan probably shouldn't have survived. 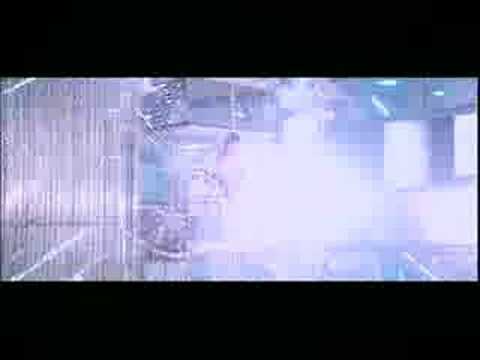 When you think of people who almost died in movies, who's the first actor that comes to mind? If that actor is anyone other than Jackie Chan, then you've never seen any Jackie Chan movies. 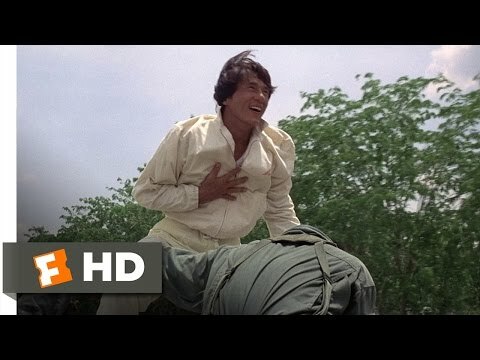 You'd need more than all of your fingers and toes (Chan has broken all of his) to count the number of times that Jackie Chan was injured during one of his many insane stunts in some of the best martial arts movies in existence. Make no mistake, he does every single stunt on his own and some of the most dangerous action scenes are ones he wrote and directed. The man is fearless and utterly bonkers and a global treasure. We have a pretty crazy conspiracy theory that suggests he might be immortal, because the following 11 stunts DEFINITELY should have killed him. Right off the bat, we're swinging for the fences with a helicopter collision. While filming Police Story 3: Super Cop, a 1992 film about Hong Kong cop Chan Ka-Kui, Jackie Chan was hit by a helicopter. 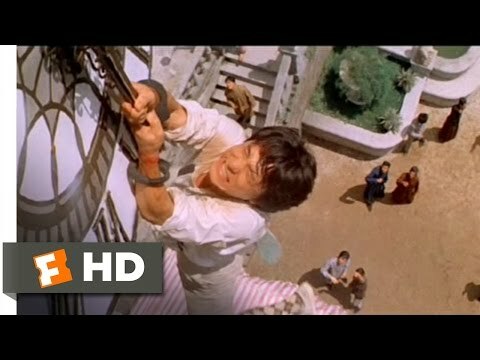 If you skip to the 1:40 mark of the video, you'll miss a lot of other near-fatal stunts, but you'll see the outtakes from a scene in which Chan dangles off of a rotating bar that extends from a train. He's supposed to be able to swing back away from the swooping helicopter, but the bar malfunctions and the action star is struck by the aircraft. He broke a rib and a bone in his shoulder, and dislocated his cheekbone, which should be impossible, but the man really can do anything. You'd think adding "occasional helicopter attacks" to his list of likely professional hazards would inspire him to switch careers, but Jackie was just getting started. After a clock tower fight scene, the script calls for Dragon, our handcuffed protagonist, to fall six stories, through two awnings and land on his head. Now, how would YOU film that? If it was the present you'd probably use CGI and if you were a coward you'd probably use a dummy or a bunch of soft mats as a landing pad. But it's not the present, and you're not a coward, you're film icon and absolute hero Jackie Chan, so you do it FOR REAL. The video you see is not an outtake; the scene played out exactly as scripted damaging his cervical spine in the process. Jackie allowed extras to help him to his feet but he finished the scene and then continued to live, which we hope he does forever. One of Jackie Chan's worst failed stunts took place during an earlier installment of Police Story. In it, protagonist Officer Chan Ka-Kui kicks a lot of bad guys and jumps on a lot of stuff (classic Jackie). He actually jumps on a pole in a shopping mall decorated with Christmas lights. Though it went as intended, the stunt still had bad repercussions for Chan. While sliding down the overheated pole, the actor burned his hands, pulled down all the light bulbs, and eventually crashed through glass. Chan, who could very well be a masochist, dislocated his pelvis and injured two vertebrae. He could've been paralyzed, but instead he just decided to be unstoppable and we love him for it. The Legend of Drunken Master is a hilarious action comedy film in which Jackie Chan's character Wong Fei-hung is a master of martial arts only when heavily intoxicated. There's a scene in which Jackie Chan gets kicked backwards onto a bed of coals that he then must wiggle across. 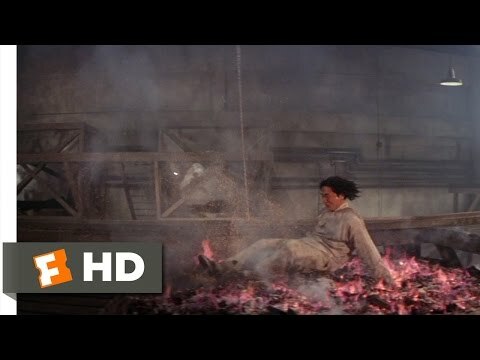 The stunt legend was adamant about doing this scene right (actually entering the coals instead of using wires to pull him across), but the director didn't think it was a good idea (smart!) so they left the project. The director thought that they couldn't in good conscious put their star through such an ordeal. And who COULD, in good conscious, ask an actor to do something so obviously dangerous? There is one man: Jackie Chan. When the director walked off the movie, Chan took over the director's chair and shot the dangerous stunt twice.